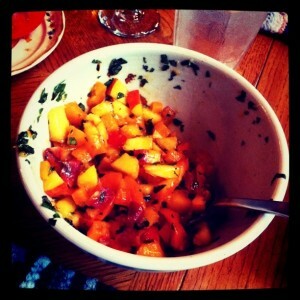 Grilled Peach Salsa: To the rescue! One of the best parts about our recent move is Durham's proximity to Western North Carolina (relative to the drive we used to have to make from Orlando, that is). Brevard (about a half-hour outside of Asheville) is one of my favorite small towns — great antique stores, antique cars, a few local restaurants, and plenty of hiking and mountain biking to be had. We're enjoying a little time out here for the 4th, which means a change in diet to match the rest of the family, which means meat at every sitting. (Ah, meat belly.) Of course we're sticking to the humanely raised rule, but that doesn't help it all to feel less heavy. Anyone who's switched from being vegetarian (or mostly) to eating meat one or more times a day can vouch for that one. For that, we turn back to veg. Specifically, we turned to freshly made salsa. Being peach season in the South, Vance and I came up with the idea to do a grilled peach salsa with roasted red peppers, basil, and mint to top off our portion of protein. This recipe ended up being a great way to bring a little freshness back into our diets, not to mention adding a little flare to the dinner. Salsa or no salsa, I'm going to need a major helping of greens tomorrow. I'm starting to feel like a caveman. This crazy colorful salsa would be great on chicken, mild fish, or pork. Also, mom liked it on a pita chip. From Bon Appétit, July 1996. Prepare barbecue (medium-high heat) or preheat broiler. Mix oil, basil, mint and garlic in small bowl. Season to taste with salt and pepper. Lightly brush cut side of peaches with half of oil mixture.